The goal of this project is the development of methods for algorithm selection and configuration under resource constraints. Especially of interest are scenarios where a single evaluation of an algorithm is expensive. We address the case where many competing candidate algorithms are available and each algorithm has specific hyperparameters that have to be tuned to obtain the best possible outcome. It is not possible to exhaustively search through this space, because the number of configurations that can be evaluated during the optimisation is heavily limited due to their long runtimes. In a typical situation the algorithm is a machine learning method that is applied on a regression or classification data set. The optimisation goal is to find a machine learning method from a set of candidates and configure its hyperparameters to achieve the best possible prediction quality. Model-based optimisation (MBO) addresses this challenge. It uses a regression model as a surrogate to approximate the objective function. For example, the prediction quality of a machine learning algorithm on a given task is predicted by a Gaussian process regression. The predictions obtained from the surrogate model help to move quickly to regions in the search space with promising prediction quality. This reduces the number of expensive evaluations during the optimisation. Due to the enormous number of possible configurations, the overall MBO wall-clock runtime still can be unreasonably long. The use of parallel computing systems and efficient resource utilisation becomes essential. To address these challenges, we have developed the framework resource-aware model-based optimization (RAMBO) with scheduling for heterogeneous runtimes. It extends MBO to work on parallel systems while maximising resource utilisation. Thus, methods applied for the optimisation to achieve high efficiency of embedded systems can be adapted for improving the parallel execution of machine learning tasks in modern computing systems. In the third phase, we want to investigate scenarios with additional challenges, such as time-varying objective functions, insufficient prediction quality due to small sample sizes, and data streams. Efficient solutions for these challenges can be obtained by extending the RAMBO framework and by further improving the scheduling strategies. Time-varying objective functions are common in the real world, i.e., the best-performing algorithm configuration changes over time, which is generally called concept drift. For small sample sizes, we will investigate the combination of real data and additional simulated data. For data streams the machine learning method will adapt to changes in order to optimise the prediction quality. These extensions of RAMBO make it usable for a wide range of applications, including data rate prediction for mobile phones as well as traffic analysis and prediction. To evaluate the new methods, we use established benchmarks that provide a controlled environment to draw objective conclusions. In a second step we will also verify our proposed approach with real-world data. In addition to the developed methods themselves, a major outcome of this project are self-contained and well-documented open-source software packages, assuring the reproducibility of the experiments and future usability for other researchers around the world. kotthaus/etal/2019a Tözün, Pinar and Kotthaus, Helena. Scheduling Data-Intensive Tasks on Heterogeneous Many Cores. In IEEE Data Engineering Bulletin, Vol. 42, No. 1, pages 61--72, 2019.
chen/etal/2018c Chen, Jian-Jia and von der Brueggen, Georg and Shi, Junjie and Ueter, Niklas. Dependency Graph Approach for Multiprocessor Real-Time Synchronization. In Real-Time Systems Symposium (RTSS), 2018. Kotthaus/etal/2018a Kotthaus, Helena and Lang, Andreas and Marwedel, Peter. Optimizing Parallel R Programs via Dynamic Scheduling Strategies (accpeted for publication)). In Abstract Booklet of the International R User Conference (UseR! ), Brisbane, Australia, 2018. Marwedel/2018a Marwedel, P.. Design of Cyber - Physical Systems. Global Initiative of Academic Networks (GIAN), Course 270, Ministryof Human Resource Development, Government of India, Indian Institute of Technology Delhi, 2018. Marwedel/2018b Marwedel, Peter. Embedded System Design - Embedded Systems Foundations of Cyber-Physical Systems, and the Internet of Things. Springer, 2018. Richter/etal/2018a Jakob Richter, Katrin Madjar, Jörg Rahnenführer. Model-Based Optimization of Subgroup Weights for Survival Analysis. No. 3, Faculty of Statistics, TU Dortmund University, 2018. Bischl/etal/2017a Bischl, Bernd and Richter, Jakob and Bossek, Jakob and Horn, Daniel and Thomas, Janek and Lang, Michel. mlrMBO: A Modular Framework for Model-Based Optimization of Expensive Black-Box Functions. In arXiv preprint arXiv:1703.03373, 2017. Bommert/etal/2017a Andrea Bommert and Jörg Rahnenführer and Michel Lang. A multi-criteria approach to find predictive and sparse models with stable feature selection for high-dimensional data. In Computational and Mathematical Methods in Medicine, Vol. 2017, pages 1--18, 2017. Kotthaus/2017b Kotthaus, Helena and Lang, Andreas and Neugebauer, Olaf and Marwedel, Peter. 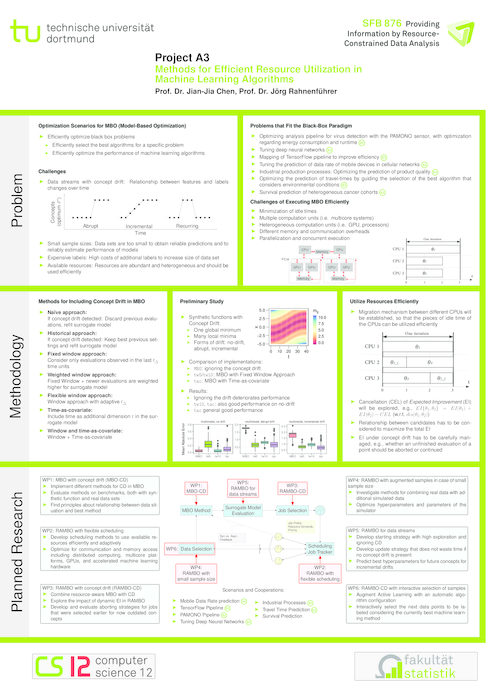 R goes Mobile: Efficient Scheduling for Parallel R Programs on Heterogeneous Embedded Systems. In Abstract Booklet of the International R User Conference (UseR! ), pages 74, Brussels, Belgium, 2017. Kotthaus/etal/2017a Kotthaus, Helena and Richter, Jakob and Lang, Andreas and Thomas, Janek and Bischl, Bernd and Marwedel, Peter and Rahnenf\"uhrer, J\"org and Lang, Michel. RAMBO: Resource-Aware Model-Based Optimization with Scheduling for Heterogeneous Runtimes and a Comparison with Asynchronous Model-Based Optimization. In Procs. of the 11th LION, pages 180--195, 2017. Neugebauer/etal/2017a Neugebauer, Olaf and Marwedel, Peter and Kühn, Roland and Engel, Michael. Quality Evaluation Strategies for Approximate Computing in Embedded Systems. In Technological Innovation for Smart Systems: 8th IFIP WG 5.5/SOCOLNET Advanced Doctoral Conference on Computing, Electrical and Industrial Systems, DoCEIS 2017, pages 203--210, Costa de Caparica, Portugal, 2017. Richter/2017b Richter, Jakob and Rahnenführer, Jörg and Lang, Michel. mlrHyperopt: Effortless and collaborative hyperparameter optimization experiments. In Abstract Booklet of the International R User Conference (UseR! ), pages 78, Brussels, Belgium, 2017. 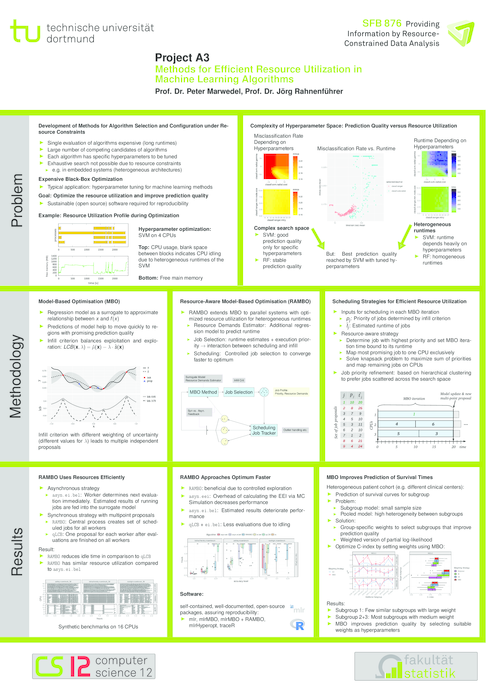 Bischl/etal/2016a Bernd Bischl and Michel Lang and Lars Kotthoff and Julia Schiffner and Jakob Richter and Erich Studerus and Giuseppe Casalicchio and Zachary M. Jones. mlr: Machine Learning in R. In Journal of Machine Learning Research, Vol. 17, No. 170, pages 1-5, 2016.
kotthaus/2016a Korb, Ingo and Kotthaus, Helena and Marwedel, Peter. mmapcopy: Efficient Memory Footprint Reduction using Application-Knowledge. In SAC 2016 31st ACM Symposium on Applied Computing, 2016. Kotthaus/etal/2016b Kotthaus, Helena and Richter, Jakob and Lang, Andreas and Lang, Michel and Marwedel, Peter. Resource-Aware Scheduling Strategies for Parallel Machine Learning R Programs through RAMBO. In Abstract Booklet of the International R User Conference (UseR! ), pages 195, Stanford University, Palo Alto, California, 2016. Richter/etal/2016a Richter, Jakob and Lang, Michel and Bischl, Bernd. mlrMBO: A Toolbox for Model-Based Optimization of Expensive Black-Box Functions. In Abstract Booklet of the International R User Conference (UseR! ), pages 202, Stanford University, Palo Alto, California, 2016. Richter/Kotthaus/2016a Richter, Jakob and Kotthaus, Helena and Bischl, Bernd and Marwedel, Peter and Rahnenführer, Jörg and Lang, Michel. Faster Model-Based Optimization through Resource-Aware Scheduling Strategies. In Proceedings of the 10th International Conference: Learning and Intelligent Optimization (LION 10), Vol. 10079, pages 267--273, Springer, 2016. Bischl/etal/2015a Bischl, Bernd and Lang, Michel and Mersmann, Olaf and Rahnenführer, Jörg and Weihs, Claus. BatchJobs and BatchExperiments: Abstraction Mechanisms for Using R in Batch Environments. In Journal of Statistical Software, Vol. 64, No. 11, pages 1--235, 2015.
kotthaus/2015a Kotthaus, Helena and Korb, Ingo and Marwedel, Peter. Performance Analysis for Parallel R Programs: Towards Efficient Resource Utilization. No. 1, Department of Computer Science 12, TU Dortmund University, 2015. Kotthaus/2015b Kotthaus, Helena and Korb, Ingo and Marwedel, Peter. Distributed Performance Analysis for R. In R Implementation, Optimization and Tooling Workshop (RIOT), Prag, Czech, 2015. Kotthaus/etal/2014a Kotthaus, Helena and Korb, Ingo and Lang, Michel and Bischl, Bernd and Rahnenführer, Jörg and Marwedel, Peter. Runtime and Memory Consumption Analyses for Machine Learning R Programs. In Journal of Statistical Computation and Simulation, Vol. 85, No. 1, pages 14-29, 2014. Kotthaus/etal/2014b Kotthaus, Helena and Korb, Ingo and Engel, Michael and Marwedel, Peter. Dynamic Page Sharing Optimization for the R Language. In Proceedings of the 10th Symposium on Dynamic Languages, Portland, Oregon, USA, ACM, 2014. Kotthaus/etal/2014c Kotthaus, Helena and Korb, Ingo and Künne, Markus and Marwedel, Peter. Performance Analysis for R: Towards a Faster R Interpreter. In Abstract Booklet of the International R User Conference (UseR! ), pages 104, Los Angeles, USA, 2014. Lang/etal/2014a Lang, Michel and Kotthaus, Helena and Marwedel, Peter and Weihs, Claus and Rahnenf\"uhrer, J\"org and Bischl, Bernd. Automatic Model Selection for High-Dimensional Survival Analysis. In Journal of Statistical Computation and Simulation, Vol. 85, No. 1, pages 62--76, 2014. Ahrens/etal/2013a Maike Ahrens and Michael Turewicz and Swaantje Casjens and Caroline May and Beate Pesch and Christian Stephan and Dirk Woitalla and Ralf Gold and Thomas Brüning and Helmut E. Meyer and Jörg Rahnenführer and Martin Eisenacher. Detection of Patient Subgroups with Differential Expression in Omics Data: A Comprehensive Comparison of Univariate Measures. In PLoS ONE, Vol. 8, No. 11, pages e79380, 2013. Cordes/etal/2013a Cordes, Daniel and Engel, Michael and Neugebauer, Olaf and Marwedel, Peter. Automatic Extraction of Pipeline Parallelism for Embedded Heterogeneous Multi-Core Platforms. In Proceedings of the Sixteenth International Conference on Compilers, Architectures, and Synthesis for Embedded Systems (CASES 2013), Montreal, Canada, 2013. Cordes/etal/2013b Cordes, Daniel and Engel, Michael and Neugebauer, Olaf and Marwedel, Peter. Automatic Extraction of Multi-Objective Aware Parallelism for Heterogeneous MPSoCs. In Proceedings of the Sixth International Workshop on Multi-/Many-core Computing Systems (MuCoCoS 2013), Edinburgh, Scotland, UK, 2013. Cordes/etal/2013c Cordes, Daniel and Engel, Michael and Neugebauer, Olaf and Marwedel, Peter. Automatic Extraction of Task-Level Parallelism for Heterogeneous MPSoC. In Proceedings of the Fourth International Workshop on Parallel Software Tools and Tool Infrastructures (PSTI 2013), Lyon, France, 2013. Kotthaus/etal/2013a Kotthaus, Helena and Lang, Michel and Rahnenführer, Jörg and Marwedel, Peter. Runtime and Memory Consumption Analyses for Machine Learning R Programs. In Abstracts 45. Arbeitstagung, Ulmer Informatik-Berichte, No. 2013-07, pages 3--4, Ulmer Informatik-Berichte, 2013. Lang/etal/2013a Lang, Michel and Bischl, Bernd and Weihs, Claus and Rahnenführer, Jörg. Automatic model selection for high-dimensional survival analysis. In Abstracts der 45. Arbeitstagung, No. 2013-07, pages 32--33, Ulmer Informatik-Berichte, 2013. Bischl/etal/2012a Bischl, Bernd and Lang, Michel and Mersmann, Olaf and Rahnenführer, Jörg and Weihs, Claus. Computing on High Performance Clusters with R: Packages BatchJobs and BatchExperiments. No. 1, Fakultät Statistik, TU Dortmund, 2012. Kotthaus/etal/2012a Kotthaus, Helena and Plazar, Sascha and Marwedel, Peter. A JVM-based Compiler Strategy for the R Language. In Abstract Booklet of the 8th International R User Conference (UseR! ), pages 68, Nashville, Tennessee, USA, 2012. Plazar/etal/2012a Plazar, Sascha and Falk, Heiko and Marwedel, Peter. WCET-aware Static Locking of Instruction Caches. In Proceedings of the International Symposium on Code Generation and Optimization (CGO), San Jose, CA, USA, 2012. Falk/etal/2011a Falk, Heiko and Kotthaus, Helena. WCET-driven Cache-aware Code Positioning. In Proceedings of the International Conference on Compilers, Architectures and Synthesis for Embedded Systems (CASES), pages 145-154, Taipei, Taiwan, 2011. Kammers/etal/2011a Kammers, K. and Lang, M. and Hengstler, J. G. and Schmidt, M. and Rahnenführer, J.. Survival Models with Preclustered Gene Groups as Covariates. In BMC Bioinformatics, Vol. 12, No. 1, pages 478, 2011. Plazar/etal/2011a Plazar, Sascha and Kleinsorge, Jan C. and Falk, Heiko and Marwedel, Peter. WCET-driven Branch Prediction aware Code Positioning. In Proceedings of the International Conference on Compilers, Architectures and Synthesis for Embedded Systems (CASES), pages 165-174, Taipei, Taiwan, 2011. Kotthaus/2018a Kotthaus, Helena. Methods for Efficient Resource Utilization in Statistical Machine Learning Algorithms. TU Dortmund University, Dortmund, Department of Computer Science, 2018. Neugebauer/2018a Neugebauer, Olaf. Efficient Implementation of Resource-Constrained Cyber-Physical Systems Using Multi-Core Parallelism. TU Dortmund, Dortmund, Germany, Department of Computer Science, 2018. Holzkamp/2017a Holzkamp, Olivera. Memory-Aware Mapping Strategies for Heterogeneous MPSoC Systems. TU Dortmund, 2017. Lang/2015a Lang, Michel. Automatische Modellselektion in der Überlebenszeitanalyse. TU Dortmund, Dortmund, 2015. Cordes/2013d Cordes, Daniel A.. Automatic Parallelization for Embedded Multi-Core Systems using High-Level Cost Models. TU Dortmund, Department of Computer Science, 2013. Netzer/2013a Christian Netzer. Vorhersage der Überlebenswahrscheinlichkeit für Patientenuntergruppen mit hochdimensionalen Daten am Beispiel zweier Lungenkrebskohorten. TU Dortmund, 2013. Kammers/2012a Kammers, Kai. Survival models with gene groups as covariates. TU Dortmund, 2012. Plazar/2012b Plazar, Sascha. Memory-based Optimization Techniques for Real-Time Systems. TU Dortmund, Department of Computer Science, Dortmund, Germany, 2012. Lang/2019a Lang, Andreas. Ablaufplanungsverfahren zur effizienten Ressourcennutzung bei der Algorithmenkonfiguration von maschinellen Lernverfahren. TU Dortmund, 2018. Lang/2016a Lang, Andreas. Ressourcengewahre Ablaufplanungsverfahren für modellbasierte Optimierungen. TU Dortmund, 2016.
richter/2015a Jakob Richter. Modellbasierte Hyperparameteroptimierung für maschinelle Lernverfahren auf großen Daten. TU Dortmund, 2015. Kammers/Rahnenfuehrer/2010a Kammers, K. and Rahnenführer, J.. Improved Interpretability of Survival Models with Gene Groups as Covariates. TU Dortmund, Department of Statistics, 2010. Lohr/etal/2010a Miriam Lohr AND Patricio Godoy AND Jan G Hengstler AND Jörg Rahnenführer AND Marco Grzegorczyk. Extracting differential regulatory sub-networks from genome-wide microarray expression data. In Proceedings of the Seventh International Workshop on Computational Systems Biology (WCSB 2010), Luxembourg, 2010. Plazar/etal/2010a Plazar, Sascha and Marwedel, Peter and Rahnenführer, Jörg. Optimizing Execution Runtimes of R Programs. In Book of Abstracts of ISBIS-2010 (International Symposium on Business and Industrial Statistics), Portorose, Slovenia, 2010. Alexa/2009a Adrian Alexa. topGO: Enrichment analysis for Gene Ontology. In \urlhttp://www.bioconductor.org/packages/release/bioc/html/topGO.html, 2009. Lokuciejewski/etal/2009a Lokuciejewski, Paul and Gedikli, Fatih and Marwedel, Peter and Morik, Katharina. Automatic WCET Reduction by Machine Learning Based Heuristics for Function Inlining. In SMART '09: Proc. of the 3rd Workshop on Statistical and Machine Learning Approaches to Architecture and Compilation, pages 1--15, Paphos / Cyprus, 2009. Podwojski/etal/2009a Katharina Podwojski and Arno Fritsch and Daniel C Chamrad and Wolfgang Paul and Barbara Sitek and Kai Stühler and Petra Mutzel and Christian Stephan and Helmut E Meyer and Wolfgang Urfer and Katja Ickstadt and Jörg Rahnenführer. Retention time alignment algorithms for LC/MS data must consider non-linear shifts. In Bioinformatics, Vol. 25, No. 6, pages 758--764, Fakultät Statistik, Technische Universität Dortmund, 44221 Dortmund, Germany. katharina.podwojski@tu-dortmund.de, 2009. Bogojeska/etal/2008a Jasmina Bogojeska and Adrian Alexa and André Altmann and Thomas Lengauer and Jörg Rahnenführer. Rtreemix: an R package for estimating evolutionary pathways and genetic progression scores. In Bioinformatics, Vol. 24, No. 20, pages 2391--2392, Max Planck Institute for Informatics, Saarbrücken, Germany. jasmina@mpi-inf.mpg.de, 2008. Plazar/etal/2008a Plazar, Sascha and Lokuciejewski, Paul and Marwedel, Peter. A Retargetable Framework for Multi-objective WCET-aware High-level Compiler Optimizations. In Proceedings of The 29th IEEE Real-Time Systems Symposium (RTSS) WiP, pages 49--52, Barcelona / Spain, 2008. Alexa/etal/2006a Adrian Alexa and Jörg Rahnenführer and Thomas Lengauer. Improved scoring of functional groups from gene expression data by decorrelating GO graph structure. In Bioinformatics, Vol. 22, No. 13, pages 1600--1607, Max-Planck-Institute for Informatics Stuhlsatzenhausweg 85, D-66123 Saarbrücken, Germany. alexa@mpi-sb.mpg.de, 2006. Falk/etal/2006b Falk, Heiko and Wagner, Jens and Schaefer, André. Use of a Bit-true Data Flow Analysis for Processor-Specific Source Code Optimization. In 4th IEEE Workshop on Embedded Systems for Real-Time Multimedia (ESTIMedia), pages 133--138, Seoul/Korea, 2006. Falk/Schwarzer/2006a Falk, Heiko and Schwarzer, Martin. Loop Nest Splitting for WCET-Optimization and Predictability Improvement. In 4th IEEE Workshop on Embedded Systems for Real-Time Multimedia (ESTIMedia), pages 115--120, Seoul/Korea, 2006. Yin/etal/2006a Junming Yin and Niko Beerenwinkel and Jörg Rahnenführer and Thomas Lengauer. Model selection for mixtures of mutagenetic trees. In Stat Appl Genet Mol Biol, Vol. 5, pages Article17, Department of EECS, University of California, Berkeley, CA, USA. junming@cs.berkeley.edu, 2006. Rahnenfuehrer/etal/2005a Jörg Rahnenführer and Niko Beerenwinkel and Wolfgang A Schulz and Christian Hartmann and Andreas von Deimling and Bernd Wullich and Thomas Lengauer. Estimating cancer survival and clinical outcome based on genetic tumor progression scores. In Bioinformatics, Vol. 21, No. 10, pages 2438--2446, Max-Planck Institute for Informatics, Stuhlsatzenhausweg 85, D-66123 Saarbrücken, Germany. rahnenfj@mpi-sb.mpg.de, 2005.